A metal clad smartphone certified by TENAA, with model number KIW-AL10, could be the Huawei Honor 5X. The Huawei Honor 4X was released earlier this year, and it apparently is time to upgrade the mid-range device. The KIW-AL10 features a 5.5 inch display with a resolution of 1080 x 1920. That works out to a 401ppi pixel density. The Snapdragon 615 SoC drives the handset, and contains an octa-core CPU and the Adreno 405 GPU. 3GB of RAM is inside, along with 32GB of native storage. The camera combo from back to front weighs in at 13MP/5MP, and a fingerprint scanner is on the back. Android 5.1.1 is pre-installed. A handset with the same KIW-AL10 model number recently was benchmarked on AnTuTu. With a score of 20916, we can pretty much see that this is not a high-end phone. Consider that the mid-range HTC One A9 reportedly scored a tad over 40,000 on a recent AnTuTu test. The One A9 is rumored to be powered by the Snapdragon 617 SoC. Perhaps a better comparison would be the KIW-AL10 versus the Xiaomi Mi 4i, which also features the Snapdragon 615 chipset. That device tallied 34,000 on AnTuTu. Of course, Huawei could still be making changes to the phone, so we shouldn't get too carried away by the low score. The KIW-AL10 certainly could be the Huawei Honor 5X. 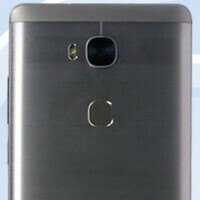 This is expected to be a mid-range phablet and the TENAA image does confirm that it is an Honor branded phone. Now that it has been certified by TENAA, it shouldn't be terribly long before the Honor 5X becomes official. Cheaper variant of Huawei G8 for India and China. So HTC ripped off that design too from iPhone 6, a whole year before iPhone 6's (not iPhone 6s') launch for HTC One Max. LOL.